Advoz is excited to announce this year’s Dignity in Dialogue recipient, Salina Almanzar. A native of Lancaster City, Almanzar is a visual artist, educator and community activist whose work has impacted residents of Lancaster. 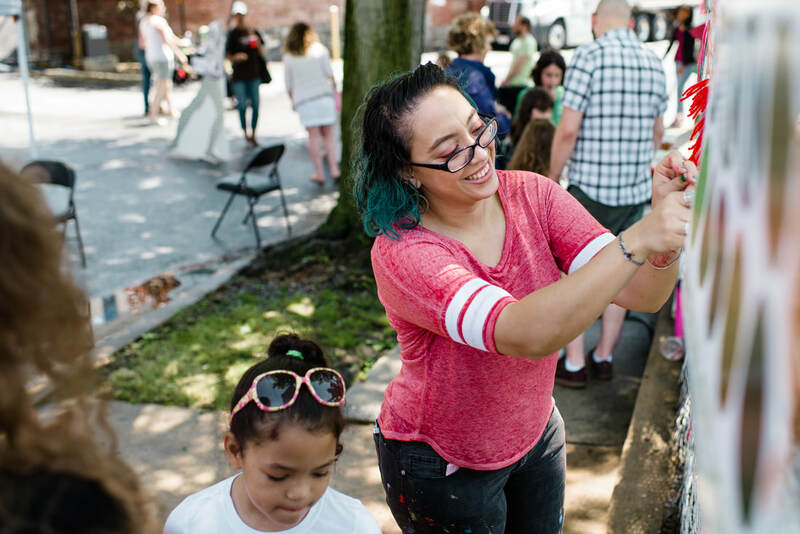 Almanzar’s art serves as a catalyst for countless conversations about the role of the Latinx community within Lancaster, neighborhood revitalization and the implementation of the arts within our school systems. Holding a MS in Art Administration from Drexel University, Almanzar has established herself as an influential member of Lancaster City. She stands as the youngest and first Puerto Rican woman to be elected to the School District of Lancaster Board of Directors, serves on the Community Engagement Committee for the Fulton Theater and is a teaching artist for Lancaster Public Art at Culliton Park. Salina Almanzar during one of many community arts events that she has led. As a community artist she has dedicated countless hours toward researching the cultural space of the Latinx community within Lancaster City. Her Graduate thesis focuses on Creative Placemaking within the Lancaster Latinx Community where she curated countless stories from community members in an effort to shed light on an underrepresented population of Lancaster. Through her art she strives to create spaces of expression and cultural preservation for Latinx people in the Lancaster area, as well as creating permanent places for the community to share. Community art collectives have been a staple throughout Almanzar’s professional art career, and she has employed her creativity to help shed light on issues within the Lancaster Community. Some of her projects include Love Notes to a Park (the ongoing revitalization on Culliton park and its surrounding neighborhoods), Arts and Craft Pop Ups, This Neighborhood Is: Portraits of Culliton Park, Like Water Community Zine, Somos Semillas at the Mix at Arbor Place, and Alza La Voz. Almanzar sets an example for us all on the importance of art within the healing process. Her art encourages community members to congregate into one space and engage with each other while creating open spaces for dialogue. On her website she states, “making together, much like sharing a meal, has the capacity to break down barriers, open up new avenues for conversation, and reveal bonds that may not otherwise be exposed”. Art, just like the dinner table, brings people together. Advoz invites you to join us April 30 for our Around the Table where we will share stories of reconciliation in our community, enjoy a seated dinner and silent and live auction, enjoy art from School District of Lancaster, and connect with fellow peacemakers. Show your support for Advoz’s reconciling dialogue and hear testimonials from the ones who’ve been through it. For more information please visit http://AroundtheTable.org or email chair@aroundthetable.org. See you around the table!